Today more than half of the world's population lives in cities; in 2050 two thirds of all people on earth will live in urbanized metropolitan areas. Traditional agriculture will not be able to provide such megacities with enough healthy nourishment. One possible solution: Urban farming – Growing tomatoes, melons and the like in the midst of the big city. But these plants will need to be fed as well, primarily with water and light. Compared to conventional light solutions in agriculture, LEDs achieve significant increases in energy efficiency and can thus help vegetable and fruit cultivation in the metropolises of the world finally break through. 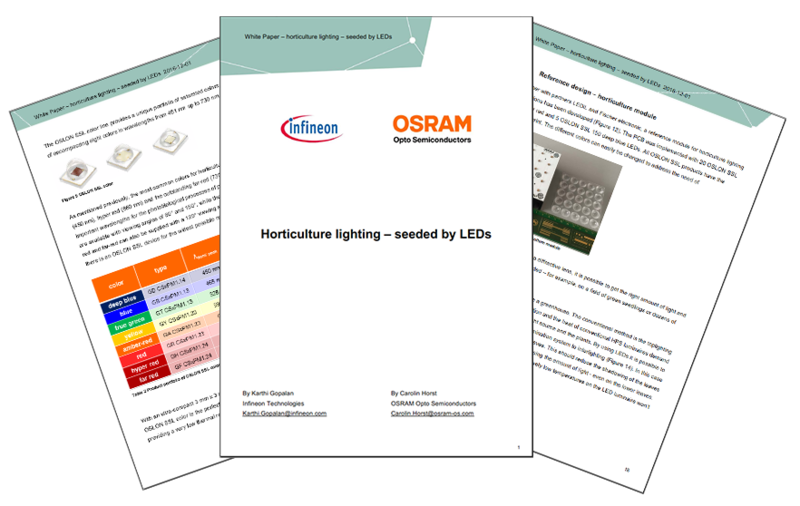 In this white paper we explain how OSRAM Opto Semiconductors LEDs and Infineon’s power solutions can contribute to these processes.